The spawning went well, and the female has recovered very quickly. Almost as if nothing happened! 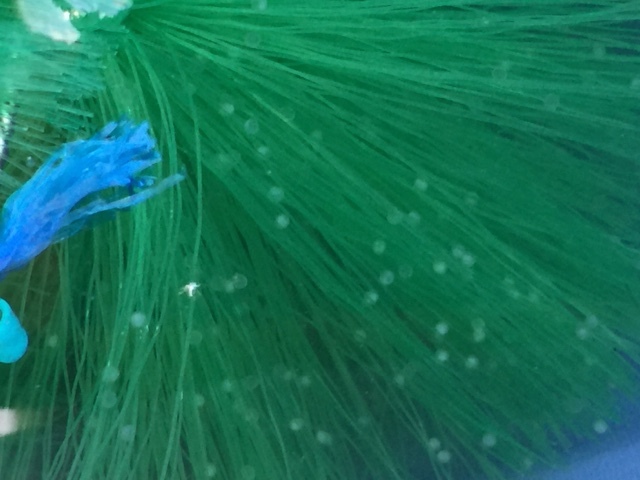 24 hours after the spawning, I could see a high proportion – certainly over half - of eggs were fertilised. I split the eggs into 3 separate rearing vessels. All good up to this point. Unfortunately, fungus took hold and decimated the eggs. In one batch, there were no hatchlings. In another batch, I pulled out around 30 hatchings. And in the other batch, there are probably a few hundred… perhaps a thousand if I’m lucky. 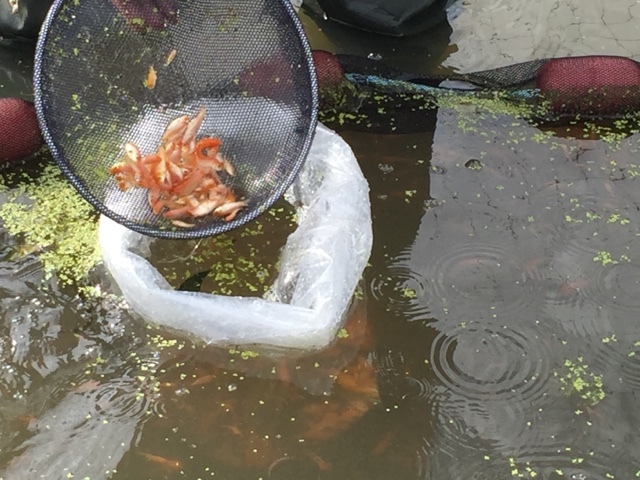 I’ve consolidated all the hatchlings into that vessel and there are not enough to give them the run of the fry pond outside – so I’ll rear inside and attempt to achieve 1 inch with enough of them to give me a view as to the quality of the brood set. I guess, it’s good there are probably enough hatchlings to give me a chance of rearing a test sample of fry, but on the other hand… it’s a big let down! 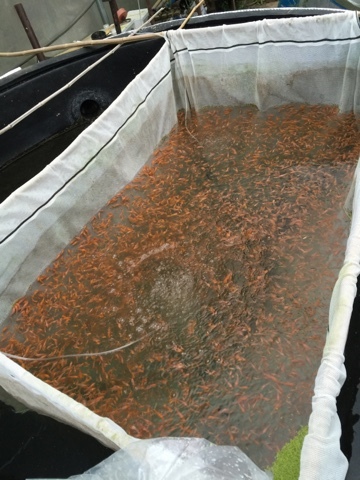 The fry pond outside is in perfect condition to take new hatchlings and even as I write, the daphnia population is increasing and the moment were the rotifer population was idea for new hatchlings may have passed. This female was a significant investment, and once again, the project has not dealt me the hand I wanted. I must now focus on completing the process of rearing the sample, and learning from that to inform which males I pair her with next year. With there being so few hatchlings from the 3 step spawning, I’ve run another spawning as quickly as I could in an attempt to have a decent number of hatchlings available during the period when the fry pond is good to receive. I decided to go with monster chops, and the two shiro males I’ve kept. And the spawning went well – monster chops laying the eggs neatly over the spawning ropes and there appear to be plenty of eggs. We ran the spawning in the same tank that I used for that disastrous spawning of Elle some months ago – there was some trepidation at using that tank again, after such a big disaster. But, it all went as planned, and it’s good to have that tank back in use again. Unfortunately, 24 hours after the spawnings, the fertilisation rate appears to be very low… and perhaps non-existent! This is the same result from spawning monster chops the last 2 years – but in each of those occasions, there was a possible reason for the loss of the eggs. This time, everything was perfect and so I have to consider her place in my collection…. It’s looking shaky. As a backup female, she’s not working out. There’s the occasional koi that we are particularly fond of, and in her case, it’s her monster chops. Hence her name. A great character around the pond…. But I need females that will spawn! It’s going to be a tough one. 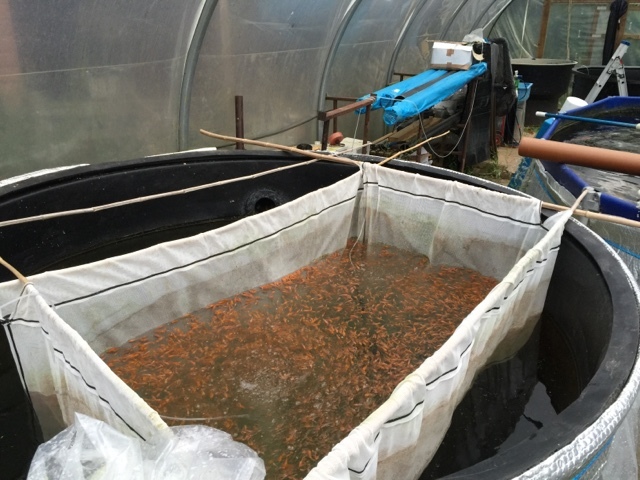 Last weekend we harvested the bottom fry pond; this where we’ve been growing on the fry from sharkey’s spawning. 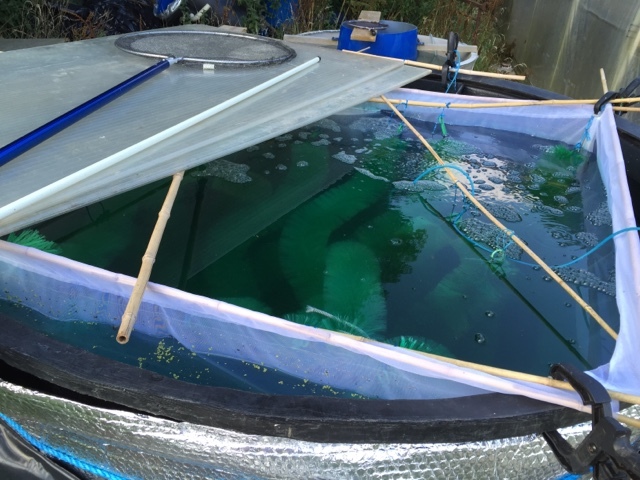 You may remember we tried a new thing in that pond… adding batches of hatchlings at several points, and basically growing on 3 sizes of fish in one go. The end result, is that we have bolstered the numbers in the final harvest considerably… but overall, we have a few thousand. 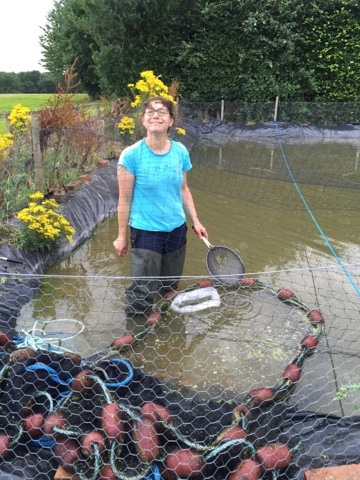 So, still much lower than the 20k to 30k from a really successful pond harvest. 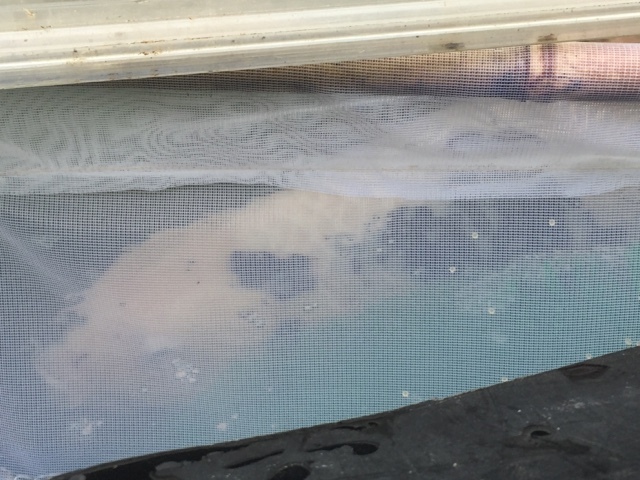 That said, the size of the largest ones is over 2 inches… and that’s pretty cool considering the spawning was just 5 weeks earlier! Not sure about the quality of the fry… too many resembling gold fish. But, I’ll let them settle for a few days before going through them and I’ll have a better idea once I’ve seen them all close up. Body wise, I’m very happy. And in particular, the heads on some of them resemble their mum and I think that bodes well for their future growth potential. 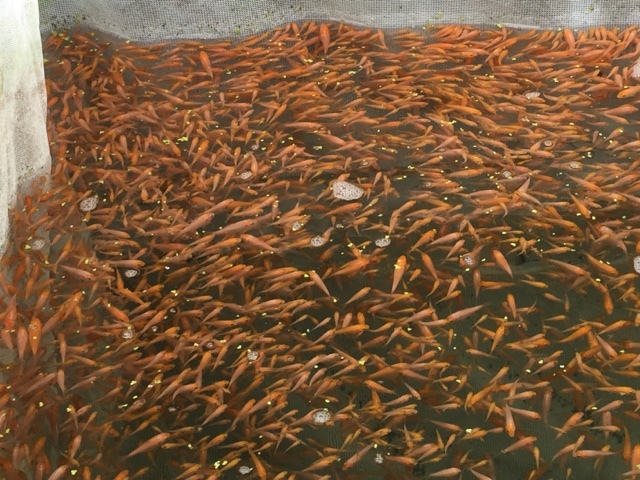 Status of the fry ponds. The top pond is clear and unfortunately, we’re starting to see daphnia blooming. That’s great for hatchlings that are 2 to 3 weeks old, but not for new ones! 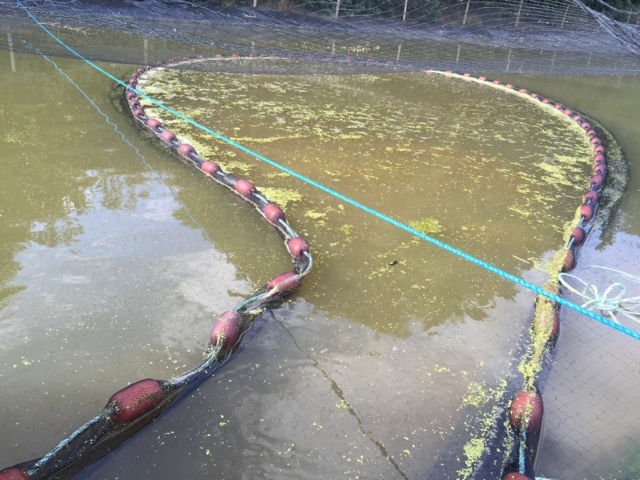 We’ve emptied the bottom pond after the harvest, and the next thing is to dry it out – vacuum up the last drops in the puddles (to avoid the ‘lock ness shiro’ situation). Then, refill and try for one last spawning. I have one more kohaku female left.. and she has spawned before. She produced the few fry we harvested in 2013.. our first year. I’m going to give her a run out, possibly with two of our home bred males. Then, there’s also the chance to run for a second time this season, our trusty okawa female. She spawned in may, and she would probably spawn again. I’d rather give her the rest of the year off, but she does give us an option. The number of jobs is overbearing. We can't keep up and I'm making prioritisation calls almost daily. In addition to all the stuff above, I've the usual set of maintenance too. We've had a second pond pump fail this month a week ago and that needs replacing. 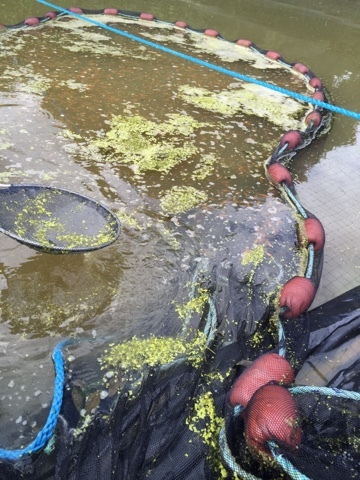 There is constant jet washing of nets, spawning brushes and tanks that are used for spawnings and then need to be cleaned before re use. 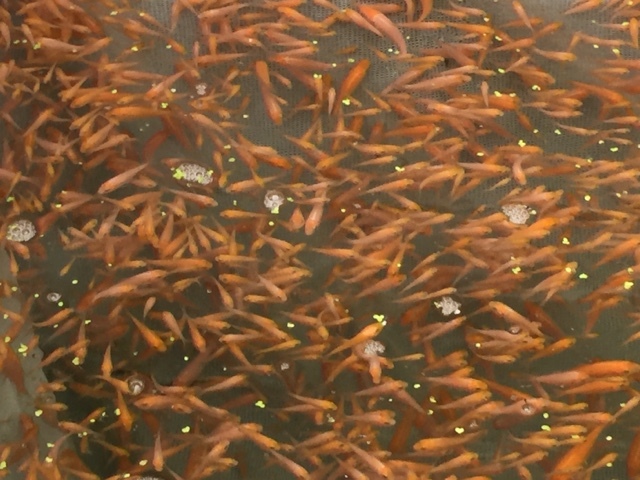 I have the selections to perform on the May 16 spawning - their tank is becoming overcrowded. And I still have to list around 20 of the Tosai from last year's spawning on eBay . But I also need to run additional spawnings because of the failure of the monster chops and the 3 step spawning - in order to make best use of the two available fry ponds outside. I'm not sure I have enough fry yet this year to give me a chance of winning competitive show prizes next year... And I need a volume of new fry to find the 1 in 10,000 level fish or even rarer fish that I need for the shows - which after all, is my main objective. 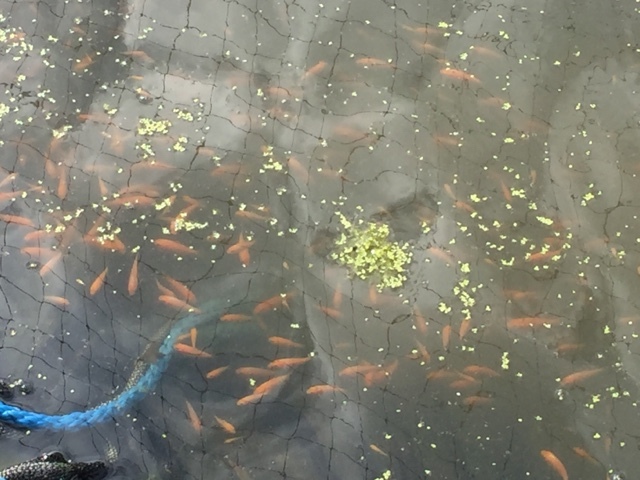 So, I am currently prioritising the breeding tasks above the moving on side of things in the hope that one of the spawnings comes good... and I don't have confidence over the spawnings completed so far in delivering me a koi that will win a competitive show prize . I just hope that we get one decent spawning before the end of the summer.